Many of you will have read that opening line, be bursting into song as you recognise the words from the theme tune of The Wombles. 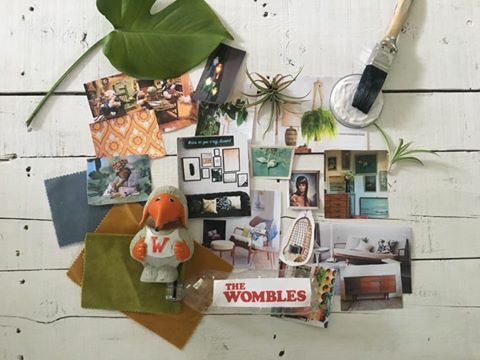 The Wombles are fictional pointy-nosed, furry creatures created by Elisabeth Beresford. They live in burrows, where they aim to help the environment by collecting and recycling rubbish in creative ways, we could (and almost certainly should…) argue that they were the real instigators of the upcycling and recycling revolution. Although Wombles live in every country in the world (FACT..), Beresford's stories are centred around the lives of the Wombles who lived in a burrow on Wimbledon Common in London. They found worldwide fame in the UK in the mid- 1970s when the BBC commissioned a children's television show about their lives. The Womble’s motto is "Make Good Use of Bad Rubbish." A message which was important then, but is even more so today. They have always been heroes of mine and I think watching their adventures on my screen all those years ago is perhaps what planted the idea of turning trash to treasure in my head and inspired me on my upcycling journey. So when I was asked to design a room set for this year’s Grand Designs Live show, I was so excited that this was an opportunity, like those clever Wombles before me, to show just how amazing a room can look when designed using things that had either been upcycled, found in Granny’s attic, rescued from skips or sourced second hand on sites such as Preloved. I also wanted to show a few products that have been made using recycled things such as rugs made from old plastic bottles, cushions made from wool rescued from landfill sites in India and glassware made from Smart Phone Screens. SO WHAT WAS THE THINKING BEHIND MY ROOM SET DESIGN AND WHAT DID I WANT TO ACHIEVE? It was important to me that upcycling and recycling is seen as chic, creative and designer led. I wanted people to feel inspired to try upcycling and I want to make them feel comfortable doing so. I wanted to encourage people to think with fresh eyes about things they may see as old and unfashionable; things that the everyday folk leave behind! I want to highlight the very real and pressing issue of landfill and plastic pollution. Whilst the design was heavily influenced by the 1970s, it showcased how we can interpret these influences within the context of a modern living room. The Gallery wall at the back of the room was a mixture of vintage art, mostly kitsch art from the 70’s originally sold in Boots The Chemist, all collated with the same colour theme, and mixed with modern pieces. I received so many comments at the show from people who recognised some of the vintage prints and each person had a story to tell about where they remember it from, I think they were stunned at how a piece of art that they remember from their past could look when restyled in a modern setting. Of course the key feature of the room was the large neon sign by Light Up North of the Wombles slogan ‘Making good use of the things that we find, things that the everyday folk leave behind.’ The aim of the gallery wall was to challenge people’s perception of what is fashionable and make them question binning things in the future if they were shown what they considered to be trash could look fantastic. The sofa featured in my design was perhaps the most brilliant example of the treasure you can find when buying second hand. I worked closely with Preloved and we found this one on the website. It’s originally from the late 60s/early 70s and was in amazing condition and exactly the look that I was going for. I have seen several newer versions of this design going for lots and lots of money so this was as real find. All it needed was an upholstery clean and it looked new and what I love most is, it’s a unique piece, I literally have found treasure! The coffee table was found in a Sue Ryder sale and I painted the legs gold with Rustoleum Metallics paint. I tried to incorporate gold throughout my design as a bit of a theme as I felt that when you found something fantastic to upcycle and turned it from trash to treasure it was like finding gold. The G plan Swivel Sixty Two Chair I found in a skip and had recovered, the bureau desk was my mother’s when she was a little girl so I wanted to use it in the design to show people that these vintage pieces that we often store away in the loft or garage because they are not fashionable can be brought back to life. I painted it in a fantastic blue Chalk Paint and used it to store the logs, looking in a family attics is a great way of finding things that with a bit of creativity may be just perfect for your home. Anything that was new which I used in the design had been sourced from companies who recycle waste into new and exciting products, I worked with www.pentatonic.com, a fantastic company who are using waste products to make super stylish new things, I featured the glassware that they make from old smart phone screens . The rugs and footstool used were made from recycled plastic bottles and were from www.greendecor.co.ukand the candles were by www.rewinedcandles.co.uk who make amazing smelling candles in old upcycled wine bottles. I found it so enlightening and reassuring to find all these companies that are literally turning trash to treasure. During the weeks leading up to the set build Homebase was my home from home as I had paint mixed on their colour match machines, stocked up on brushes, paint, wood cladding and nails for my nailgun. I have never been one for designer shops, to me a few hours in a DIY store is heaven, I just have to try and stay focused on the job in hand and my shopping list as I find myself distracted and wanting to try all the new products that I see. I was so thrilled to win ‘Grand Designs Interior Designer of the Year-roomsets’ for two reasons, firstly it was lovely that the judges and the public loved the design and that they totally got the meaning behind it. I think for years I have been viewed as the ‘crazy chick’ in the dungarees always jumping out of skips but to be taken seriously and get the recognition as someone who can create a design that people admire and would want in their home was so motivating and rewarding. Secondly I am so proud as I think in some small way I have drawn attention to something that I am truly passionate about ‘upcycling ‘ and sustainable design. We cannot keep sending things to landfill and using materials without recycling them we are literally clogging up the planet. This was my opportunity to show people how amazing and designer led your room can look by not buying new and sourcing products to use that have been made from upcycled things. I am looking forward to carrying on my upcycling journey and inspiring people with creative sustainable design… you will still find me in skips but now I don’t feel crazy anymore, I feel like a woman on the beginning of my mission. A warrior on waste with a keen eye for design and creativity. Thank you to all who came and saw the room set and thank you all for your amazing messages and questions. It would seem that I am not alone in my concern for sustainable design and love of Kokedamas!! !